Cupcakes 'n Daisies: A Visit With Old Friends . . . . . While I was visiting my daughter, I snapped some pictures of the quilts that I've made over the years, that she is currently displaying in her new apartment. "Myths of Avalon" . . .
is on her wall, right as you enter the apartment. I still love this quilt, and am happy I have its twin (but not identical twin) at my house. "Ashley's Favorite Plaid" . . . .
"Pat's Quilt" . 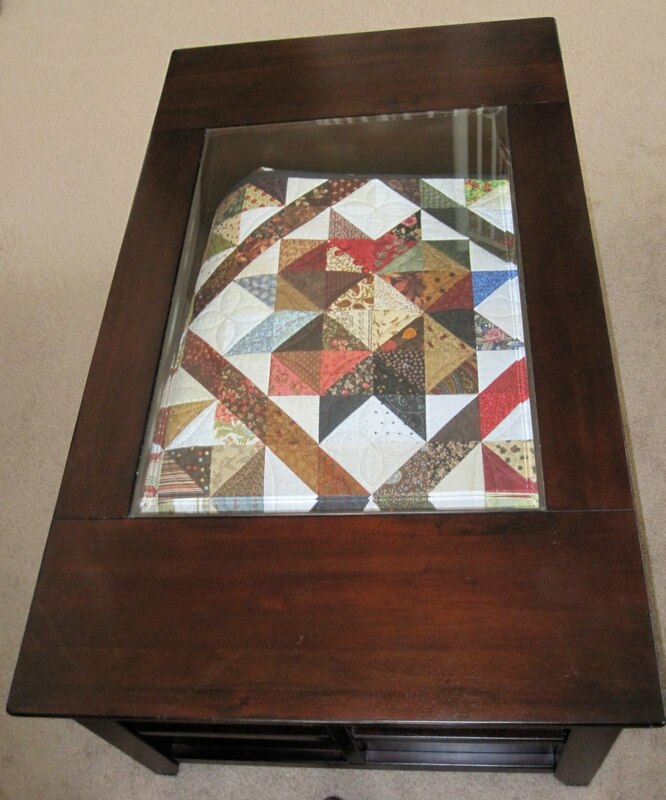 . .
is all folded and neatly displayed in the coffee table. "USC vs UCLA" . . . Here are some lovely roses that my daughter bought just for our visit, she's thoughtful that way. We could not have had a nicer time or a better visit, it was, like most things in life, just too short. Beautiful, Beautiful! Love your daughter's coffee table. Thelma, There are so many things that change a 'house' into a 'home', but I think quilts work best. Somehow, they just seem to add a warm, welcoming feeling. An atmosphere that makes everyone who walks through the door feel comfy...no matter the season. Thanks for sharing these pictures. All of the quilts she has displayed are lovely and her home seems wonderful. Well, the weekend is almost here and I hope yours is great. Hugs coming your way! beautiful quilts and I am glad you had a great visit with your daughter. those are special times! Your Daughter is a lucky girl. I love your scrappy look, and those plaids, to dead for. Plaid goes with any thing. It is not only nice to revisit them, but also the fact that your daughter appreciates the beauty of your art so much that she would decorate with them, too. That's an honor to your love of quilting, and her love for you! They all are worth honoring, too! is absolutely stunning! I love the way you figured out the placement of the HST but, wow, what alot of work. It turned out fabulous. At first I thought it was a traditional block that I had seen many times but when you broke it down and I saw the extended border of the block, I knew that was NOT it. So now you have company on the "wonder where you came from" bus. I ooh and aah over Ashley's Favorite Plaid! That would be a good one for the fashionista in my house, too. I hope you come back to visit soon! We enjoyed your visit so much and when you come back later you can take pics of all the holiday quilts you made me! I can see why your daughter has so many of your quilts. She truly appreciates them and the loving time you put into them. My fav is the Myths of Avalon - no surprise there as I love anything red. so nice to see the quilts your daughter has displayed so nicely in her home. my DD would love that plaid quilt too, how did you do that! It was the Myths of Avalon quilt that hooked me on your blog. I have that pattern, and I want to make it in reds as well. All your projects are inspiring, but I guess I've said that way too many times! Keep up the good work; yours has to be one of the best quilting blogs. How nice it is that your daughter is using all the quilts. They are all so wonderful! I think I like "Pat's Quilt" th best because it is so colorful.